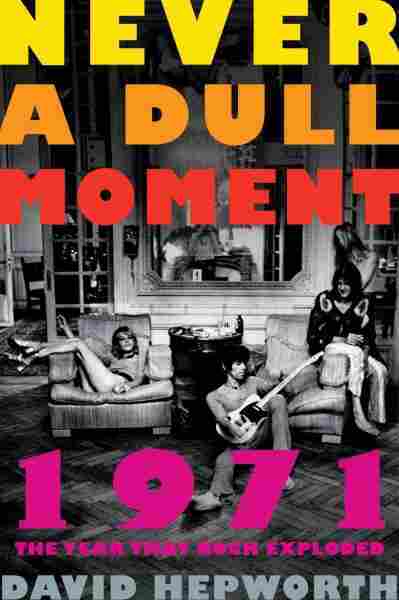 The Case For 1971 As Rock's Greatest Year That year, music journalist David Hepworth argues, offered an explosion of talent from David Bowie, Led Zeppelin, Al Green, John Lennon and more. He discusses his new book, Never a Dull Moment. What do Van Morrison's "Domino," the Rolling Stones' "Brown Sugar" and Marvin Gaye's "What's Going On?" have in common? All of them were recorded or became hits in 1971 — the year music journalist David Hepworth insists is the best year in rock 'n' roll history. In his new book, Never a Dull Moment, Hepworth makes the case that the music from 1971 was the result of "a huge explosion of creativity in a very short period of time" and lives on in the present like most old music does not. He explained his theory to NPR's Kelly McEvers; hear the radio version at the audio link, and read an edited version below. Kelly McEvers: You write about this idea that record companies had during this period, where once you've had a successful release, there shouldn't be much of a delay before the next one. Don't hesitate, don't edit yourself — you, the 26-year-old dynamo you, should just go for it. David Hepworth: They had no reason to believe that these people were going to continue to be popular longer than a few years. The most extreme case is David Bowie: He releases The Man Who Sold the World, records and releases Hunky Dory, and then records all but one track of Ziggy Stardust and the Spiders from Mars in the year 1971. They were just racing to take advantage of the opportunity they suddenly got, and they didn't waste an enormous amount of time, like they have done since, in polishing the thing afterwards. They worked on the principle of, "Your first thought is your best thought." And they were their best thoughts. Just on your David Bowie premise alone, I'm feeling more convinced that 1971 was a good year — but there were so many major albums that year, and I just wanted to run through a few of them and get your thoughts. One that I hadn't thought about in a while is Carole King's Tapestry. You say this album took off for many reasons, one of which is that she sang the way we all thought we could sing. It's a quote from one of her fellow singers, that "she has the voice that every woman likes to think she has." I think it's a fair point that it's not like a performer's voice — it's a very personal voice, like an interior voice. Prior to that really, she'd only done demos for professional singers to do professional versions of. And so what Lou Adler, her producer, wanted to do was to make a record that felt like a demo, that had that kind of integrity of a pencil sketch. Which is one of the beautiful things about it. An album that I don't think many people would argue with is Led Zeppelin's IV. The band kind of ignored the press and didn't have traditional album covers, and because of that was able to create its own mythology. It's something that you say would be impossible to do now. One of the points I make in the book is that social media has made it impossible for bands nowadays to have the mystique that Led Zeppelin had in 1971. You never saw them on the television, you hardly ever saw a photograph of them, you had very little idea what they looked like or how they stood onstage or how they behaved. You couldn't go to YouTube and look up loads of clips of them. So Led Zeppelin very cunningly exploited this. The packaging of Led Zeppelin's IV doesn't have the name of the band, doesn't have the name of the album: It's got a guy on the cover with a load of sticks on his back. This record didn't quite get to No. 1 in the United States — it went to No. 2 — but stayed on the charts for years and years and years. Do you think 1971 is the best year because it was a formative year for you, personally? I know you were 21 then, and it was the first year you were a music journalist, so of course that's going to feel huge. But there are other years, right? 1969 was also a major year! There's loads of very good years, and there are books being written about other years. There's a very good book about 1966, a book about 1957. And they're all perfectly admissible subjective accounts. But it stands to reason that one of us must be objectively correct, and I think that's me! I think you only have to go into your local coffee shop, and the evidence of that great "I am" will be available to you. In terms of the fact that I was 21 at the time, I don't feel nostalgic for any other aspect of 1971. I don't want to sit there and watch an evening's TV from 1971, thank you very much. But the music of 1971 lives in the present.